On the only sunny day of our Cornwall trip this summer (I know – we picked the one week of the summer where the weather wasn’t that great to go on holiday!) we headed to Fowey for the day. On arrival we parked in an all day car park at the top of the town, only to discover on a Tourist Information sign that we had been pronouncing the name of the town wrong all week – it’s pronounced foy as in joy! 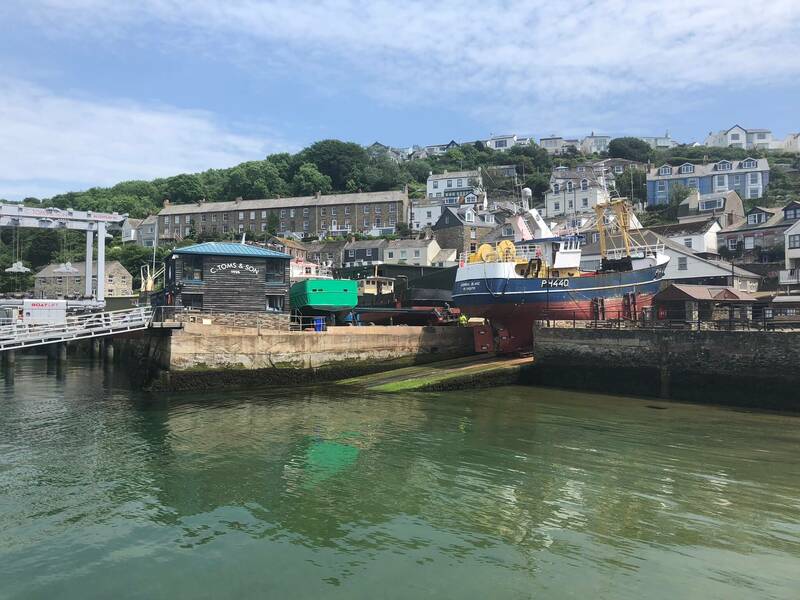 Parking is quite limited in Fowey but it was a pretty quiet day when we visited so we managed to get a space in Main Car Park which is about a five minute walk down a steep hill to the town itself – it takes slightly longer on the way back up! 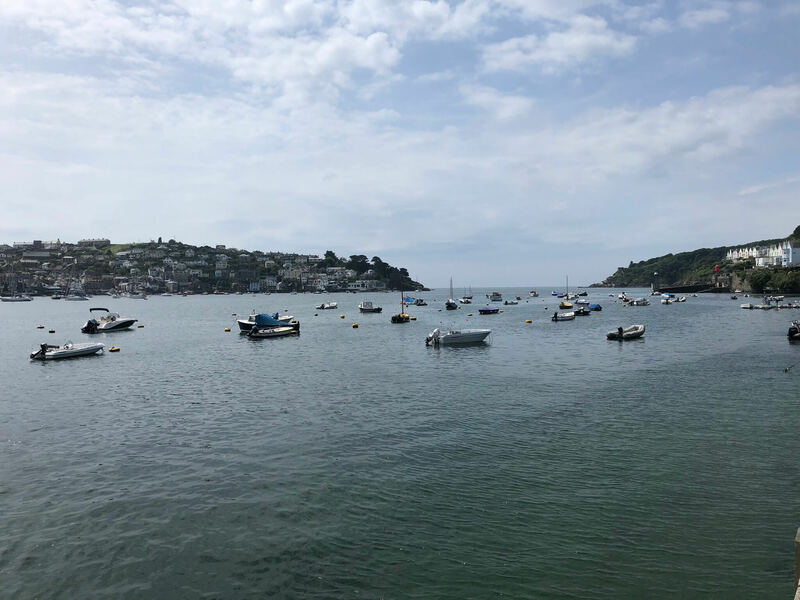 Fowey is a really pretty little harbour town and we spent hours just pottering around the narrow streets and the estuary. 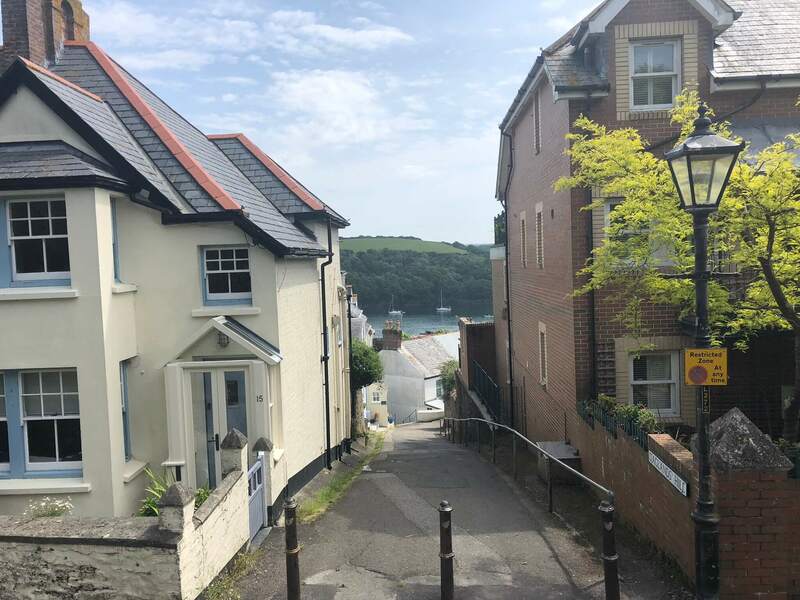 There are lots of independent shops and pubs with outdoor seating areas – which suited us just fine – and lots of pretty houses overlooking the estuary which immediately made me want to move to Fowey. We started our day with a traditional Cornish cider at The Galleon Inn. 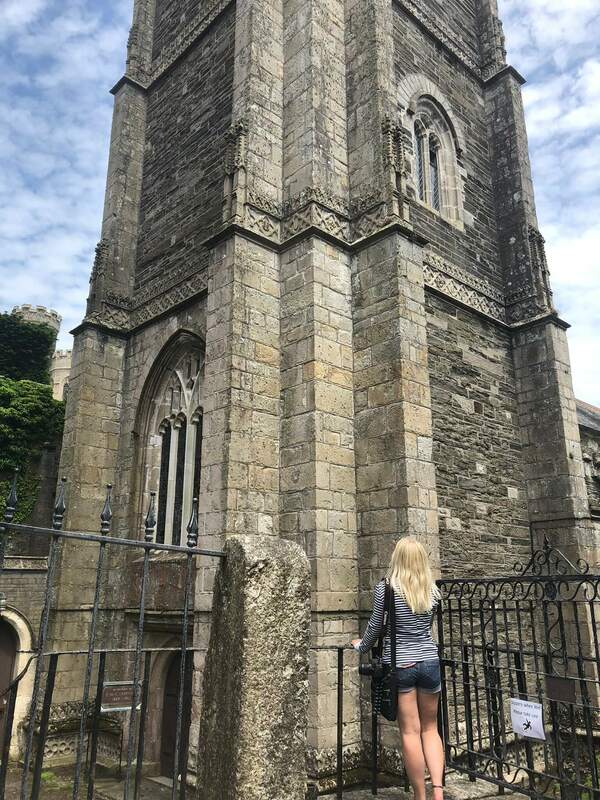 On our wanders we also stumbled across Fowey Parish Church which dates back to the 12th century. It’s a really impressive, beautiful building. We also picked up some delicious ice cream from an ice cream shop with the best name ever – Game of Cones. There are lots of different flavours and I went for honeycomb which was amazing – the perfect treat on a beautiful day. We also took the Polruan Ferry across the estuary to Polruan where we stopped for refreshments at a pub overlooking the estuary. The ferry is dog-friendly which made it perfect for our trip and it operates every 10-15 minutes so you can nip between the two. After our day in Fowey, we headed to Charlestown, about a mile outside of St Austell. The town was a late Georgian working port and is just stunning. 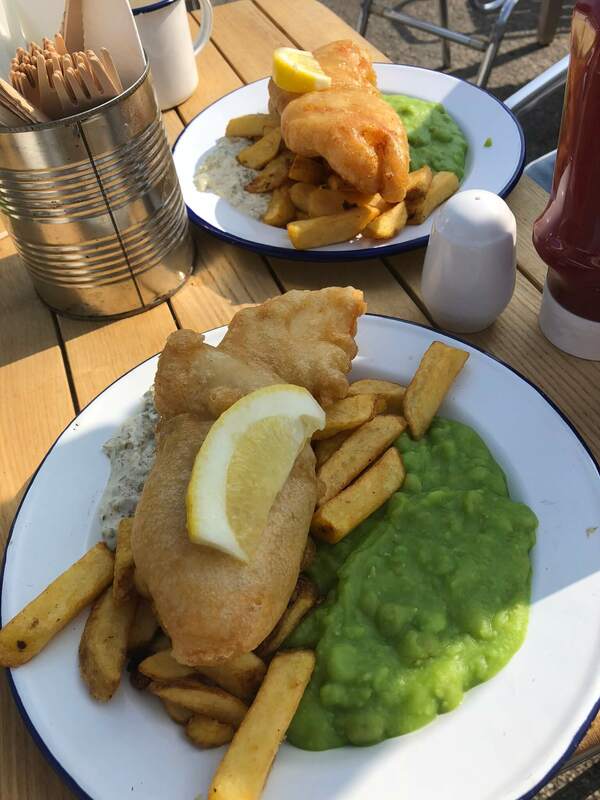 We ate fish and chips here at Keep Cornwall Fed. 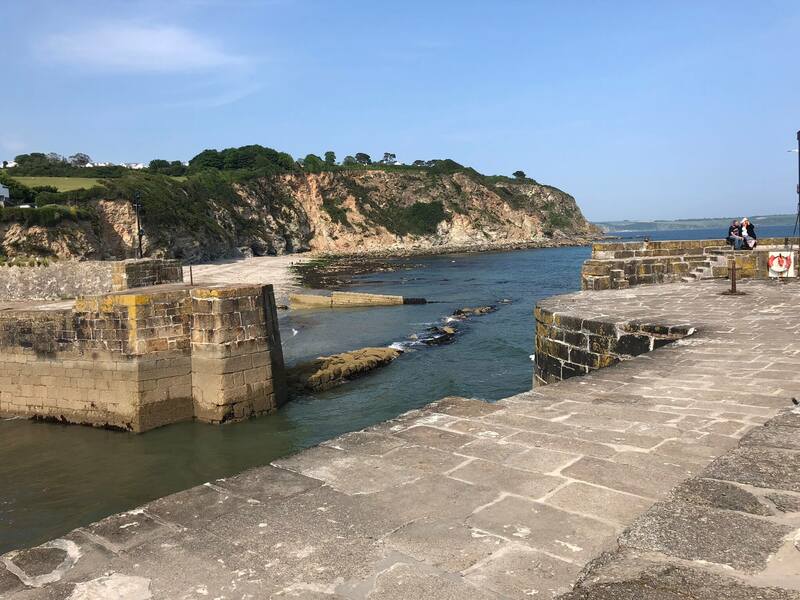 They are a social enterprise where, for every meal you buy, they will feed homeless people living in Cornwall – the food was great, the location stunning and we felt that we were doing some good by eating there. After a busy day, we headed back to our camper van and finished the evening with gin and tonics and the Cornish sunset – absolute bliss! Kids would love to come here, been meaning to travel down for a few years but the 6 hour journey always seems a slog! You’re right – it definitely is a long way to go! I do think it’s totally worth it but I’ve always made really good times on my journeys, I’ve heard about people getting stuck in traffic and it taking NINE HOURS!